Light Pollution Filters – CLS and Skywatcher – A minefield of misinformation? Firstly, I’ve not had the opportunity to test many types as of yet, as these things are not cheap! As I get more info, and test the filters, I’ll update this page with some examples of the difference they can make to an image. Of course, there are many other types of LP filter available, and it’d be interesting to hear from others in the comments that have had experience of these. a) The stars ended up being elongated due to the mount not tracking perfectly. This was due to the mount not being guided at the time, and so not accurately tracking the stars for imaging purposes. 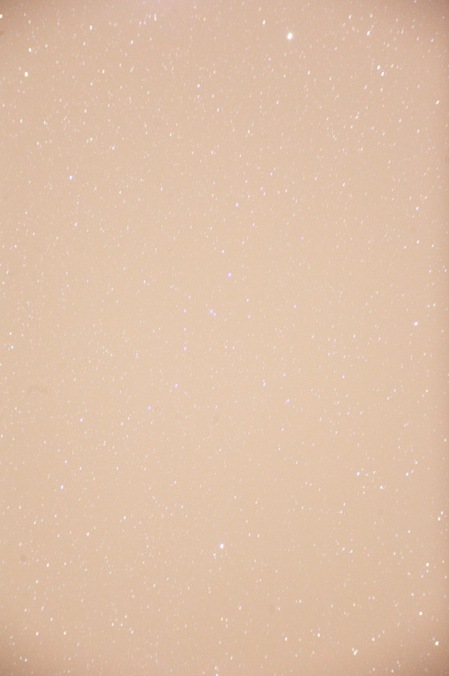 b) Secondly, and most relevant in this case, the exposures were an absolute mass of orange light pollution. This second issue is, unfortunately, a side-effect of being located in the middle of an English city. Not one of the worst light-polluted either! The frame to the left is a raw example of what I got with a slightly hazy sky. Ignore for now the wobbly stars (which come from somebody knocking the mount!). You can clearly see the extent to which LP can affect exposures. This one is only 3 minutes too! 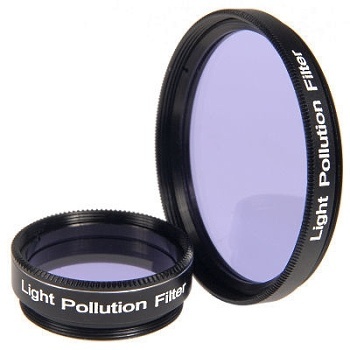 Unfortunately, with more and more of us observing and imaging from a light polluted sky, LP filters are becoming more of a necessity than ever. There are a few things to remember when using LP filters in general. Firstly, they are not a ‘magic bullet’ when it comes to light pollution. These filters are helpful, but they have their drawbacks. All of them are designed to block out only particular wavelengths of light. The cheaper ones do this, but their isolation to those particular wavelengths is not as good, and they tend to block quite a bit more. They’re also not as good at blocking what they’re supposed to be blocking. In general, the more expensive the filter, the more accurate the blocking of the right wavelengths. That’s not to say that the cheaper ones are no good – they all help to one degree or another when imaging, and to a lesser degree when using them visually. All LP filters have one overriding factor to consider when deciding how effective they will be for you. They’re designed to block the wavelengths emitted by low pressure sodium vapour lamps – the orange type. If the area you happen to observe in is lit by newer LED-type lamps, then LP filters will be basically useless. Unfortunately, there isn’t a filter that will deal with these types of lamps, as the wavelengths they emit are also emitted by the very objects we want to see. Filtering them out would also filter out the objects themselves. The upshot of this is that generally speaking, newer lamps are better designed, and direct more of their light downwards. However, if you want to escape these lamps, then unfortunately, the only way is to get away to a dark sky site. It’s a good idea to test out a filter first, either by getting it from a seller that will allow you to return it if it’s ineffective, or by borrowing one from a local astro society if possible. If these options aren’t open to you, then bear in mind you can usually resell LP filters for minimal loss if they’re in good condition. The downside of any filter is that it will almost always have an effect on the image in one way or another.  The Skywatcher adds a definite colour cast, as does the Astronomik filter. They also cut down the total light getting to the sensor, so the exposures required will be longer.  However, it should increase the ratio of useful image information compared to background glow, so overall should result in an improvement. These are a particular type of LP filter that are particularly popular amongst imagers. Part of the reason for this is that they come not just as standard 1.25 and 2″ threaded types, but also as EOS clip filter. This type of filter actually clips directly into the camera, behind the lens bayonet, and directly in front of the mirror/sensor. This means they can be left permanently in the camera, and used with the vast majority of combinations of lenses and scopes. They also serve to protect the innards of the camera from dust. The thing that confuses people about these is that they come in two types, CLS, and CLD-CCD. The CLS-CCD is more expensive (about £20-30 more). So what type do you need? Well, it all depends on a few factors. The biggest of these is whether your camera is modded or not, and if so, what type of mod it has had. Astro-modding a DSLR involves removing one or more filters that cover the main sensor, to make it more sensitive to the red end of the spectrum. This allows the camera to pick up dimmer objects that emit in the Hydrogen Alpha range, for example reflection nebulae. The main difference between the two types of filter is that the CLS-CCD also blocks the IR wavelengths that CCDs are particularly sensitive to, and can cause what’s called ‘star bloat’. This happens due to the IR not focussing in the same way as the visible light, so whilst your visible end of the spectrum is in focus, the IR is ‘out’. This results in the IR being effectively superimposed onto the image, but out of focus. By the way, this is only an issue with refractors, not reflecting telescopes. With reflectors, there is less of a need to block the IR wavelengths anyway. Whether the camera has been astro-modded and the way in which a camera has been modded will dictate the type of filter you need. The vast majority of EOS users will only need the cheaper type. CLS-CCD – You need this one if you have a CCD (d’oh! ), or an EOS camera that has had ALL filters in front of the sensor removed (the so-called full-spectrum mod). This will ensure no star bloat, as the IR wavelengths will be blocked by the CLS filter too. CLS – This type is for everyone else! If you have ANY type of filter remaining in your camera following modification, then at least 97% of all IR will be filtered anyway. This can be either because when modded, you camera had a Baader filter installed, or be due to the fact that your model of camera has two filters, of only one is removed during modifications (for example, 1000D, 1100D, and a few other models). In these types, only one of the two filters is removed. Therefore, save yourself some money and buy the standard version of the CLS filter. There are many places that seem to imply that you NEED the more expensive CCD version if you’ve had any type of astro mod at all. This is simply not true. As long as you have one of the sensor filters still in place, or a replacement Baader filter, then it’s not required. Get the cheaper one! At the time of writing, I’m waiting on delivery of one of these, so will report back when Ive had a chance to test. This is a budget LP filter from Skywatcher, a well-established Chinese maker of scopes, mounts and accessories. It was my first LP filter, and I ordered it in the hope it would make somewhat of a difference to what I was experiencing further up the page. I ordered the 2″ threaded filter, as at the time I was using the Canon 5D, so wanted the full width of the 2″ focussed to play with (due to the full-frame sensor on that camera). As you can see, the brightness of the ‘orange’ part of the light pollution is definitely reduced. This makes it easier to process out the remaining colour cast. However, the overall reduction is not as good as I was hoping for. Whether this is due to the standard of the filter, or whether it’s due to the type of LP in my location, I’m not sure. I think its probably a combination of the two. Bear in mind that this was an extreme example also, as the air was quite hazy that evening, so it’s probably a bit harsh to expect everything to be clear on the image! 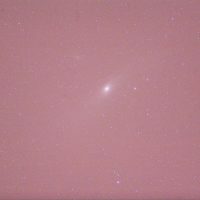 Just as a quick demonstration of just how hazy it was that night, here’s a pair of images – the first shows a shot of M31 taken that night, and the second shows a shot of M31 taken a few nights later, when the haze had dispersed a bit. Both were taken using the SkyWatcher LP filter. I’m looking forward to seeing what I can achieve with the CLS filter that’s on it’s way to me at the moment. I’ve seen some fantastic results by people living in heavily light-polluted areas using these, so fingers crossed, it’ll really help. I’ll place and information page with the same content in the top menu of the site, and update that once I’ve had more of a chance to test. That’s 2 IR filters, does that matter? Hi Adam, very comprehensive write up. Just to add to the CLS vs CLS CCD differences, I’ve had both and while Astronomik don’t publically state it in the specs, I found through experiment that there is actually quite a big difference in the results from the 2 versions, and after I sent a couple of example images to Astronomik they confirmed to me that my findings were correct that the differences between the 2 go beyond just the ir blocking, in fact transmission across the whole spectrum is different. The good news is I found the cheaper CLS performed better than the CCD version, providing you don’t need the ir blocking as described in your post. Specifically the standard CLS passes considerably more Ha emissions than the CCD version. They are both great filters and I actually use both versions of the filter, so I have the standard CLS in my Canon 1000D and the CCD version on my CCD camera. You say you went for the 2″ version of the SW filter. How did you attach it in your optical train? I have a SW ED 80 and a Canon DSLR. Interesting write up. I have just had my Canon 1100d Baader modified and in the interim I have been using my visual Sky Watcher LP filter. It certainly works as without it the images were unusable. That’s said I am looking to buy a Astronomix CLS filter soon. Have you since purchase one and can you say whether there were any significant differences between this and the stock SW filter? The CLS has been ordered and is sitting at the Post Office waiting to be collected tomorrow. Weather looks poor for a while plus full moon. So will have to wait a while longer before I can try it out. 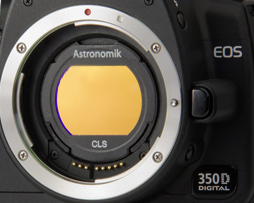 You’re correct in what you say about the difference between the Astronomik CLS and CLS CCD. The CLS CCD blocks IR whereas the CLS doesn’t. The CCD version is suitable when using a refractor because even expensive ones may not be colour corrected for IR, leading to the ‘star bloat’ problem you mention. 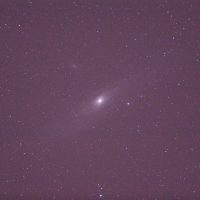 If you have an all-mirror telescope (e.g. a Newtonian ) the standard CLS version is better as it allows more H-alpha through. Of course to take full advantage of this, you need a camera modified by the removal of the built-in IR filter. I spoke to Bernard at Modern Astronomy (http://www.modernastronomy.com) today, and he confirmed this. He said if I owned a modded camera, or thought I might get it modded in the future, the standard CLS filter is the one to go for – so I’ve ordered a CLS EOS clip for my currently unmodded Canon EOS 500D. The website has a very comprehensive page on filters and offers 1.25″, 2″, EOS clip and EOS XL clip formats. Also the prices are the lowest I can find on the Internet, and postage is free! The CLS EOS clip is currently on offer for £99. Bernard has always been a good source of kit and has no issues having a chat about anything you have problems with in my experience.